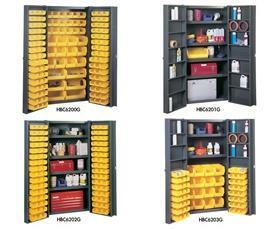 Bin Storage Cabinets | Morrison Industrial Equipment Co. Fully assembled cabinets available in 38" or 48" extra wide. 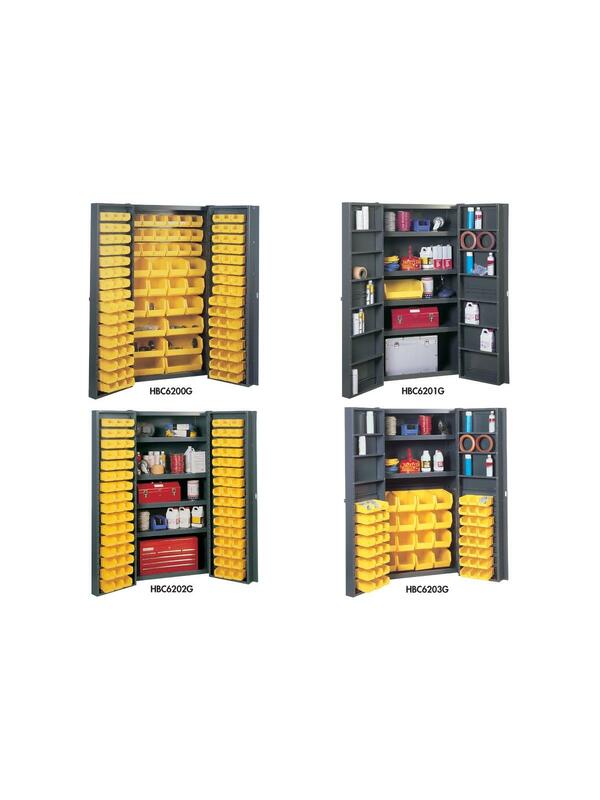 The perfect solution for securing and organizing parts, equipment and other valuable inventory items. Made of rugged 16 ga. all welded steel construction for durable service. Inside shelves have load capacities of 800 lbs. (for 38"W.) and 700 lbs. (for 48"W.), evenly distributed on 4" centers. 4"D. pocket doors with heavy-duty hinges on 270° and accommodate bins and/or 30 lb. capacity shelves. Complete with padlock hasp (padlock not included), leveling feet, bins and/or shelves. Tough powder coat finish in Gray. Heavy-duty removable plastic bins in Yellow. FOB Shipping Point. 38"W. inside shelf size is 2"H. x 37-1/2"W. x 18"D.; door shelf size is 3/4"H. x 18-3/8"W. x 3-3/4"D.
48"W. inside shelf size is 2"H. x 47-1/2"W. x 18"D.; door shelf size is 3/4"H. x 23-3/8"W. x 3-3/4"D.
4-1/8 x 5-3/8 x 3"
4-1/8 x 7-3/8 x 3"
5-1/2 x 10-7/8 x 5"
8-1/4 x 14-3/4 x 7"
16-1/2 x 14-3/4 x 7"